This is a human egg magnified 400 times. Eggs have been difficult to freeze, but a new way of storing and freezing eggs is offering women who want to preserve their fertility a different option. “Being able to deliver healthy babies from frozen eggs is an important development that is very exciting,” says Sarah Keller, MD, assistant professor of obstetrics and gynecology and head of the egg donor program at Washington University School of Medicine in St. Louis. 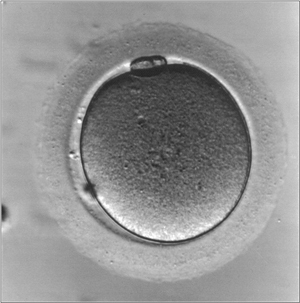 Until recently, the only method for freezing eggs caused ice crystals to form in the egg. These crystals sometimes destroyed the egg’s structure, making it impossible to create an embryo. With the new method, eggs are frozen so quickly that ice crystals don’t have time to form. The result is a solid cell that resembles glass. The newer procedure can help women diagnosed with cancer who want to preserve their fertility before chemotherapy or radiation and women undergoing in vitro fertilization (IVF) who do not feel comfortable freezing embryos. Egg freezing also is an option for women in their late 20s and early 30s who want to delay having children because of personal or financial reasons. Cryopreservation, or the freezing of tissue for later use, has always played a key role in assisted reproductive technology. The freezing of sperm and embryos to be used later in IVF has become routine. Although the American Society for Reproductive Medicine still considers egg freezing experimental, Lanzendorf says it is a well-established practice that a number of infertility centers in the United States are offering as part of ongoing clinical trials. Keller says that the use of frozen eggs in IVF is yet another valuable tool to help preserve fertility in women. “We want women to know that this technology is available and hope that it will make an important difference to many families,” she says.